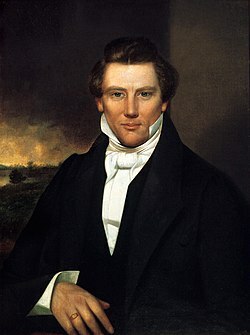 Joseph Smith – central figure of Mormonism, whom the teachings of most List of sects in the Latter Day Saint movement hold to be the founding Prophet. Smith is also called the Prophet of the Restoration. Mormonism – the teachings of Jesus needed to be restored because all existing churches fell into a Great Apostasy. Joseph Smith is the Prophet who restored all lost teachings of Jesus through Revelations. Parents: Lucy Mack Smith, Joseph Smith, Sr. This page was last edited on 21 March 2019, at 04:05 (UTC).